Mosquito and Other Insect Repellents | Gardens Alive! Q. Dear Mike: Can you suggest a good insect repellant for use on the body that will be effective against ticks, mosquitoes, etc.? Many thanks. A. Great question, Larry—and just in time to inform people planning to slather themselves with DEET about the dangers and limitations of that chemical repellant and their more natural alternatives. One of my biggest concerns with DEET is that a lot of the chemical is absorbed through your skin, travels through your bloodstream and is then excreted. I don't know about you, but I already give my liver and kidneys enough work. And although DEET is effective at preventing mosquitoes from feeding, its ability to deter ticks is highly debatable. Ticks are a subject unto themselves, so visit this previous Question of the Week for details on your tick-specific control options. And visit this previous Question of the Week for info about preventing mosquitoes from breeding on your property and some products you can use to keep outdoor areas free of the bloodsuckers. Repel Lemon Eucalyptus Insect Repellant: In April of last year, the Federal Centers for Disease Control finally got off their high toxin horse and acknowledged that this product ""is effective at preventing mosquito bites."" Previously, only chemical repellants had been so honored. In a follow up to his original study, Dr. Fradin reported that this product provided complete protection for an average of two hours under the same test conditions as Bite Blocker. As you might expect from the name, its repellency comes from a lemon-scented eucalyptus plant. Its available on the web and at camping stores—but make sure you get the right stuff. Repel also makes a lot of repellants that contain the nasty chemical DEET. 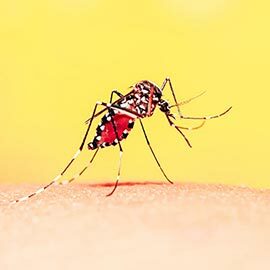 Just remember that—with plant leaves or a commercial product—mosquitoes will bite any area left unprotected; so leave no flesh un-slathered or leafed! Dr. Coates adds that his research leads him to strongly believe that a naturally occurring compound found in the peel of the Osage orange—yes, that weird pockmarked tree fruit—is even better, lasting up to six hours and repelling both ticks and mosquitoes. We'll be following this research closely. 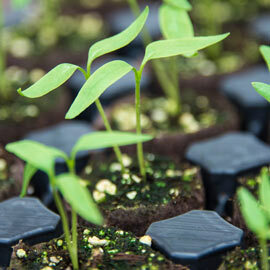 And finally, you may have already heard news reports about a new mosquito repellant isolated from tomatoes. As the developer of this new repellant, Dr. Michael Roe, Professor of Entomology at North Carolina State explained to me recently, the active ingredient—a naturally-occurring compound known as ""undecanone""—is found not in the fruit, but in the plant's stems. And not in the stems of tomatoes like the ones growing in our gardens either. Undecanone is produced in the stems of 'wild tomatoes', very hairy primitive Peruvian ancestors of our summertime favorites, whose fruits are fuzzy, like peaches. So don't waste your time rubbing your tamata plants all over yourself. Unless you simply like doing that kind of thing, of course. Dr. Roe found that natural compounds used by this primitive plant to repel insect attack also repel mosquitoes and ticks. Tests in North Carolina and Canada have shown that the compound—now dubbed ""BioUD""—provides protection as good or better than chemical repellants containing up to 30 % DEET. The compound—already in use as a food flavoring agent—has received several US patents as an insect repellant and is worming its way through the legal process with final EPA registration approval expected this Fall. When that approval comes, "" BioUD"" will replace the current active ingredients in the Bite Blocker line of products.